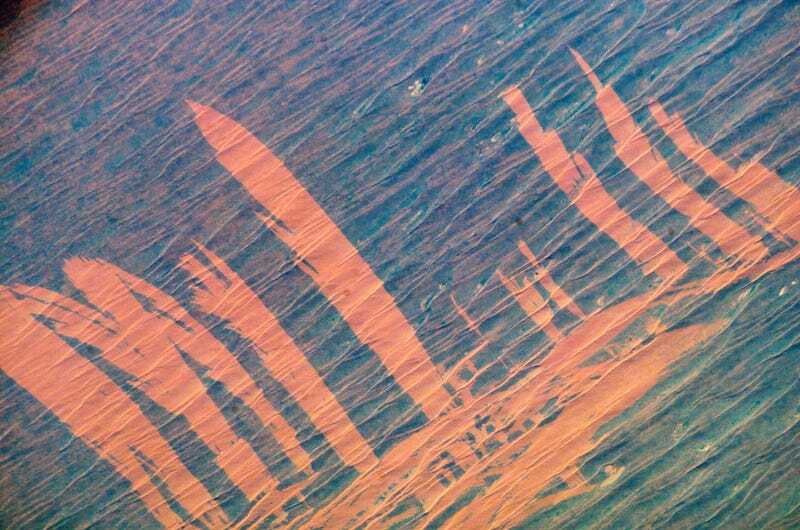 November 23, 2002: Fire scars cut through the green scrub to the orange dunes below in this view of the Simpson Desert, Australia. The background texture are linear sand dunes angling diagonally across the scene. The green mat of scrub vegetation have tied the dunes into place, tying them down from migrating across the desert. Fires first advanced into the view from the lower left—parallel with the major dune trend and dominant wind direction. Then the wind shifted direction by about 90 degrees so that fires advanced across the dunes in a series of frond-like tendrils. Each frond starts at some point on the earlier fire scar, and sharp tips of the fronds show where the fires burned out naturally at the end of the episode. The sharp edges along the burn scars are because of a steady light southwesterly wind. The weak wind prevented sparks from setting off additional fires. The fire scars were photographed by a member of the Expedition 5 crew to the International Space Station approximately 312 kilometers (200 miles) above the Australian outback and 300 kilometers (186 miles) east of Alice Springs.